Mamma Mia , Uwe Rosenberg, Abacus Spiele, 1999. Mamma Mia is a fast and fun card game for 2 to 5 players. Like Guillotine and Family Business , Mamma Mia is an excellent beer-and-pretzels type card game, perfect for that odd half hour at the end of a game night, families with younger players, or as an introductory game for non-gamers and socialites. Mamma Mia also has quite a bit of strategy that keeps the more-serious gamers interested in the game long after snapping the shrink wrap. The game rules can be explained in a short time. There are two types of cards in the deck: pizza ingredients and pizza orders. The ingredients are of five types, or "suits" if you will, that correspond to the five colors of the players - mushroom (brown), olive (purple), pepper (green), pepperoni (red), and pineapple (yellow). Many people who play the game, myself included, mistake the pineapple for a wedge of swiss cheese. The number of ingredient cards in play depends on the number of players in the game, but in a five player game there are 13 of each, and fewer cards for fewer players. 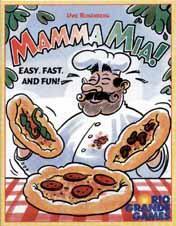 The pizza order cards each depict one of 8 pizzas that you are trying to build during the game. Each player's pizza orders are set on tablecloth background that matches the player's color to help with identification at the end of a round. Some pizza orders take one of each ingredient. Others take 3 of one ingredient and 1 of another. The humungous Pizza Bombastica requires 15 ingredients of any type! The goal of the game is to fill as many pizza orders as possible in the span of 3 rounds. 8 pizzas is a perfect score. During a turn a player must place one or more pizza ingredients of one type on the common play pile. Then, the player optionally plays a pizza order card hoping to complete the order at the end of the round when the draw pile is completely exhausted. The player draws ingredients or pizza order cards to bring his hand back up to 7 cards. Scoring takes place at the end of a round, when the play pile is sorted and orders are filled. If a pizza order is revealed and not enough ingredients are available, a player may add ingredients from his hand in order to complete the order. Completed orders score a point. Incomplete pizza orders are returned to the player's order pile. Part of the strategy in this game is to figure when to play a pizza order. Waiting for all ingredients to be played on the table is a safe strategy but will likely be beaten by riskier, more aggressive players. A common strategy is to play a pizza order slightly before all ingredients are available and to save the remaining ingredients in your hand to finish the order at the end of the round. Some players mentally make a note of which ingredients are "reserved for played pizzas". Other players physically shuffle the ingredient cards in hand to ensure a completed order later on. Card counters with perfect memory have an advantage in this game, and card counting is a must to form any kind of strategy. Only random strategies and best wishes do not require some analysis of the played ingredients. However, there are certain plays which will confound the card-counters and prevent this from being a dry memory exercise. For instance, the "Joker Pizza" order requires one ingredient and six of another ingredient selected at the end of a round. Since a card counting player cannot tell which joker ingredient a player will select, this effectively stops a card counter from assuring a certain ingredient is available. "Pizza Minimale" also has the same effect. This pizza requires 3 ingredients from the smallest ingredient stack which can only be guessed during ingredient play since the minimal ingredient stack is decided at the end of the round. In general the more cards that are played from the hand at the end of the round, the more confounded is the card counter. Another important item to note is that each player has a favorite ingredient. For instance, the green player's pizza orders are likely to use peppers with one order requiring FOUR jalapenos - now that's a spicy pizza! If you are seated next to the green player, it is worthwhile to play peppers sparingly lest your competitor make good use of your discards. Another hint is to err on the aggressive side in this game, especially in the last round. The upside is that counting mistakes by other players may make ingredients available for your order. An unfilled pizza order simply goes back in your pile with no penalty. The game play changes according to the number of players in the game. In a two player game, the ingredient stack is very predictable, and there is only one opponent play before you get a chance to place an order. On the other hand, a five player hand is somewhat unpredictable. There will be 4 opponent plays before you get another chance. It is often nerve wracking to watch your opponents snap up the ingredients that you so-carefully played. For five player games I wish there were a way to change the turn order. Going round and round is a bit boring for me. An interesting variant might be to allow playing out of order when certain conditions are met. For instance, whenever you need just one ingredient of your own color to finish an order, you may play out of turn. If two players satisfy this condition, the first one to shout "Mamma Mia" gets the privledge of playing. After this preemptive play, the next person in normal turn order may play. Another implementation might be to use the Mamma Mia card as a "turn buster." You may hold this card in your hand, but throwing the card down and shouting "Mamma Mia" allows you to move out of turn. In terms of production value, I give this card game extremely high marks. Pizza Tony and the card artwork are colorful, humorous, and pleasing although one minor complaint is the rather dull and dry Abacus-Spiele logo on the back of each card - how about something more colorful? The English rules provided with the Rio Grande Games version are well done, and our group had few questions or ambiguities. I am unfamiliar with Uwe Rosenberg's other games such as the popular Bohnanza and La Isla Bohnita card games, but based on the fun and value of this game, I am sure I will investigate his work further. Highly recommended. [an error occurred while processing this directive] Last modified: Thursday, 09-Jun-2011 12:36:51 MST.